The current high level of activity continues at Gallery Galschiøt. We have an Impaled Polar Bear-exhibition in front of the Danish Parliament, a Fundamentalism-exhibition in Copenhagen and a bunch of other things which we look forward to tell about. First, though, we have some sad news. 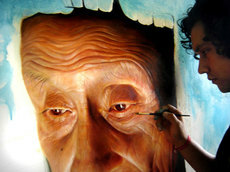 We recently received a message that the Mexican artist Emmanuel Cruz died, in too young an age. Emmanuel worked at our workshop studio during 2009. He impressed us all with his hyperrealistic art-pieces. We are going to miss him and his artistic talent. We have made a memorial-exhibition showing those of his works we were able to get hold on, it can be seen at Gallery Galschiøt in Odense, Denmark. From April 15. the sculpture ‘Unbearable’ can be seen in front of the Danish Parliament in Copenhagen. The Green Party and Galschiot have arranged the exhibition. During the exhibition a number of events will be organized focusing on the climate crisis, which is as threatening as ever, in spite of the COP21-agreement from Paris. 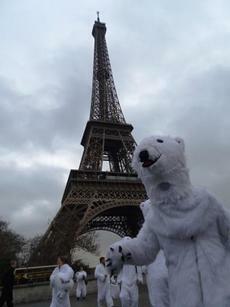 At the same time our Polar Bear Army is going to New York in order to participate in climate activities on April 17 – 22. We are working intensively to prepare the Fundamentalism-sculpture for an exhibition in Copenhagen from April 26 (more on this later). And we are trying to arrange an exhibition of Pillars of Scripture inside the EU Parliament. 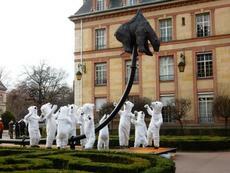 On April 15 we erect the impaled polar bear-sculpure ‘Unbearable’ in front of the Danish Parliament in Copenhagen. The Green Party arrange the exhibition in cooperation with Jens Galschiot. The exhibition will put focus on the climate crisis. In relation to the exhibition, a number of debates will take place in the Danish parliament and other activities will happen around Copenhagen. The latest climate news give a bleak picture of the future to come, so the exhibition is very much needed.The Danish government seems not to have notices the alarming situation at all. Instead it opens up for more Danish CO2 emissions. Programme: Friday April 15 - Erection of the sculpture (10am-4pm) and official opening of the exhibition (4pm-5pm). If you are in Denmark you are more than welcome to participate – send me a mail and I will make sure you get all the information you need. We are working with the Danish artist Jacob Fuglsang Mikkelsen who is arranging to bring our Polar Bear Army (which was extremely popular during COP21 in Paris) to New York. The ’army’ is to participate in a lot of climate activities in New York from April 17. to April 22. Amongst other things Earth Day, POLAR BEAR CO2 RIDE and a Union Square Event – activities that are expected to attract more than 100.000 people. 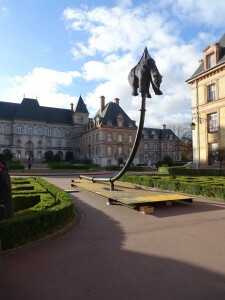 At the demonstrations one will also find a large copper sculpture model of the big Unbearable sculpture. At present the model can be found at the office of the President of the United Nations General Assembly, Mogens Lykketofts in New York. The sculpture 550+1 which focus on prostitution and trafficking was meant to be exhibited at the Women conference Women Deliver in Denmark from May 16-19 this year. So was the sculpture 'In The Name of God' (a pragnent crucified teenager) which deals with womens right to sexual information and the right to use contraceptives. It seems the women organisations in charge are affraid of critisizing the Catholic Church, which actively forbids the use of contraceptives and sexual education. We believe that it is absolutely absurd to ignore that so many of the world's women are actually suppressed through religious movements. This is a discussion everybody wants to take when it comes to Muslim women lacking basic rights, but when it comes to the Christian church oppressing, all the rights movements become quiet. Galschiøt also suggested to invite the Nicaraguan Catholic women's rights movement "Catolicas por el Derecho a Decidir", to Denmark for the conference. They are actively using Galschiøts sculpture in their struggle for women's rights. But this too seems to have the wrong focus. At Gallery Galschiøt, we are frankly quite resentful. We were officially invited to the initial conference meetings which lead up to the Women Deliver conference, and already last spring we presented the sculptures. Galschiøt has abandoned the idea of exhibiting at Women Deliver as he does not believe that it is the mission of art to focus on trafficking and ban on contraception in an "an uplifting and solution-oriented" way. 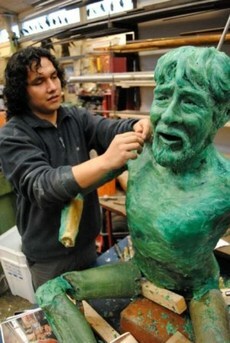 In 2009, the Mexican painter and sculptor Emmanuel Cruz worked and lived at our workshop studio in Denmark. Recently he tragically died a too early death after an accident, falling from a 6 meter high staircase. As an artist, he was hyper-realist and able to make extremely accurate representation of reality, both when he painted and when he modeled. As an artist, he was going through an interesting developments and he had great success. The world has lost a talent that could have come a long way. He is probably one of the artisanal best talented artists we have ever had at the workshop and we still have many works he has helped create when he was here. We have made a memorial exhibition with some of his paintings and photos at Gallery Galschiøt. The exhibition is open daily, free of charge, at Banevænget 22, Odense Denmark. No newsletter without an update from Galschiøts to date biggest project. In April we open our first public space exhibition of the monumental sculpture Fundamentalism right next to City Hall. The exhibition happens in connection to ‘Heavenly Days’ see homepage - an inter-religious / Christian festival which is expected to attract over 20,000 religious people from Denmark and abroad. The exhibition opens on April 26, and ends with the Heavenly Days festival from May 5-8. More about this in the next newsletter which is dedicated to this exhibition. On the EU front, the exhibition of Fundamentalism sculpture in front of the EU parliament seems to be called off after Martin Schulz chose to reject the 30 elected EU parliamentarians' request to exhibit the sculpture. But we have not given up completely and Bendt Bendtsen of the conservative People's Party in Denmark is now investigating the possibility of exhibiting a number ‘Pillars of Scriptures’-sculptures inside the EU parliament instead. Such an exhibition would be quite important because it focus on the monotheistic religions similarities. It will be seen by some of Europe's most influential people, and hopefully help to nuance the present religion debate. Furthermore we are in contact with the Roskilde Festival which is considering exhibiting the sculpture at this year's festival. On August this year a huge “Children of Abraham” exhibition will take place in the Danish town of Varde. Einar Wegener painting inspires the final scene in the movie "The Danish Girl"
At Gallery Galschiøt we have made a small exhibition of Gerda and Einar Wegener in connection with the movie "The Danish Girl" which just won an Oscar. 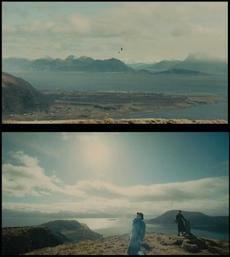 Great was our surprise when we saw the movie and found out that the painting that hangs in the gallery might have been inspiration for the movies final scene. The painting was bought at Christie's in New York and is relatively well known on the Internet. 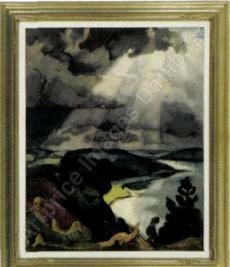 It's almost identical with the movies final scene where Gerda Wegener (supposedly) look out over Vejle fjord. 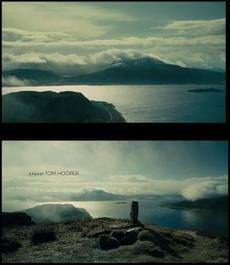 However, it is quite a mountainous landscape and any Dane know that there are no mountains in Denmark. The entire area is approximately 10.000 m2 and it is open for audience all working days between 9am and 5pm. It is open at sundays between 12am and 4pm. - Closed during the saturday and other holidays. You can book a guided tour. Free admission. Gallery Galschiot is the sculptor Jens Galschiot's 2500 m2 studio and museum. The place is one of Denmark's most spectacular and biggest private art workshops. The place is full of activities, and besides the artist's workshop, there is also a bronze foundry, gallery shop, art schools, wicker workshop, TV-studios, Sculpture Park and a 400 m2 art gallery. If you visit Jens Galschiot at his great atelier and workshop, with dedicated people, you will get a feeling of witnessing something great, and as time goes, the life's work will start to form and be seen in the greater perspective, you will understand that this art goes further than the borders of Denmark. Jens Galschiot is one of a kind on the international and Danish art scene, and his artistic activities have attracted much attention all around the world. His intense commitment, energy and artistic talent has something to say, and his sculptures and art happenings touches everybody who sees them. The entire artistic work is mainly about having something to say and having the heart in the right place - to make the world's sufferings and taboos visible and make the viewer think and make up his own opinion about the matter. This is art that is not subject to the bourgeois norms. It dares to move against the stream, and that is what great art is about. The strength of the work is that it does not end up in a rigid protest, but offers genuine indignation paired with emotions, aesthetics, sensuality, energy, and humor. - Recommendation from a visitor at Gallery Galschiot. 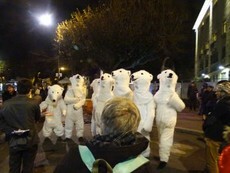 Galschiøts Polar Bear Army - during COP21 in Paris. Now it travels to New York to put focus on the climate. 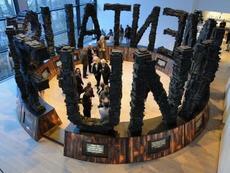 Fundamentalism will be exhibited by the City Hall Squar in Copenhagen from April 26. Scenes from the Movie "The Danish Girl"
This mail has been sent from the sculptor Jens Galschiøt's workshop.